20 ივნისს, 17:00 საათზე, ხელნაწერთა ეროვნული ცენტრის ილია აბულაძის საგამოფენო დარბაზში გაიმართა გამომცემლობა ,,ბაკმისა’’ და ხელნაწერთა ეროვნული ცენტრის ერთობლივი გამოცემის „ფსალმუნნი და გალობანი“ პრეზენტაცია. წიგნი გამოიცა სრულიად საქართველოს კათოლიკოს პატრიარქის მცხეთა–თბილისის მთავარეპისკოპოსის, ბიჭვინთისა და ცხუმ–აფხაზეთის მიტროპოლიტის ილია II–ის ლოცვა–კურთხევით. გამოცემა ილუსტრირებულია ცენტრის H ფონდში დაცული ხელნაწერის „ჯრუჭის ფსალმუნი“(XIII-XIV სს) მინიატურებით, ტექსტი წარმოადგენს გიორგი ათონელის რედაქციას. აღნიშნული უნიკალური გამოცემა ხელნაწერთა ეროვნული ცენტრისა და გამომცემლობა „ბაკმის“ ერთობლივი მუშაობის შედეგად შექმნილი მესამე წიგნია. 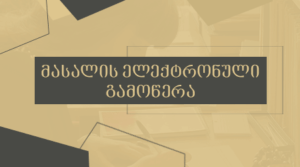 ამ დრომდე გამოიცა ორი უნიკალური წიგნი: XII საუკუნის გელათის სახარების მინიატურებით შემკობილი პირველი დასურათებული ‘’სახარება’’ და წერეთლისეულად წოდებული XVIII საუკუნით დათარიღებული ვეფხისტყაოსნის მინიატურებით გაფორმებული ‘’ვეფხისტყაოსანი’’. ცენტრისა და გამომცემლობა ‘’ბაკმის’’ მიზანია მდიდარი ქართული ხელნაწერი მემკვიდრეობისა და ქართული მინიატურის ხელოვნების ნებისმიერი დაინტერესებული პირისთვის ხელმისაწვდომობა და პოპულარიზება, წიგნის ილუსტრირების ძველი ტრადიციის აღდგენა და ახალი კულტურის დამკვიდრება. წიგნი გამოიცა საგამომცემლო პროექტ „განძი–რჩეულის“ ფარგლებში. ღონისძიების მხარდამჭერია ხელნაწერთა ეროვნული ცენტრის „მეგობართა საზოგადოება“. 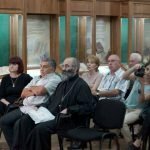 On June 20 at 17:00 pm at Ilia Abuladze exhibition hall of the National Centre of Manuscripts was held the presentation of joint publication of the publishing house “Bakmi” and the National Centre of Manuscripts – “Psalms and Chants”. The book was published by the blessings of Catholicos-Patriarch of all Georgia, the Archbishop of Mtskheta-Tbilisi and metropolitan bishop of Abkhazia and Bichvinta, His Holiness and Beatitude Ilia II. The publication is illustrated by the miniatures of “Jruchi Pslam” (XIII-XIV) preserved at the H fund of the centre, the text is edited by Giorgi Atoneli. 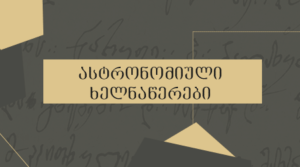 The above mentioned unique publication is the third book created by the joint collaboration of the National Centre of Manuscripts and the publishing house “Bakmi”. Until now were published two unique books: The first illustrated gospel by the miniatures of Gelati Gospel of the XII century and “The Knight in the Panther’s Skin” illustrated by the miniatures of the book dated by XVIII century. 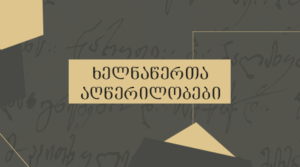 The goal of the Centre and the publishing house “Bakmi” was popularization of rich Georgian manuscript heritages and the art of Georgian miniatures and make them available to any interested persons, reestablish the old traditions of illustrating the books and establish the new cultures. The supporter of the event was Friends of the National Centre of Manuscripts.